This is the best equipment for technicians who need supervise machinery, even if they are not experts in vibration analysis. The vast majority of maintenance technicians don’t have the appropriate tools to carry out their tasks. By giving them the resources to evaluate the machine status, we increase their diagnosis capacity and at the same tame we encourage them to do their best at work. To reduce the duration of maintenance shutdowns and design an optimal repair planning, an accurate diagnostic is needed. To apply in a proper way the TPM strategy, we must provide our production technician with the correct tools to see, listen and feel the machines. Another application for PRE5050 Expert Machinery Tester is the predictive supervision of rotating machinery. We can note down the vibration global values, wave envelope values, and temperature, so it will be possible to supervise the machinery progress from its initial status up to the moment that develops a break. The most original feature of this product is the automatic diagnostic function that uses different colors (green, yellow, orange and red) depending on the importance of the break. Overall vibration levels will be shown in a very intuitive graphical, after we notify the rotational speed of the machine’s rotor to the equipment. We will also see the degree of imbalance, misalignment, looseness and bearings deterioration. Automatic detection of the machine’s rotational speed. All these features allow the technician to detect the failure from its initial state. 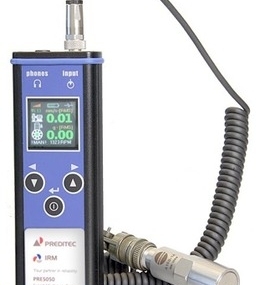 Each technician has to have his own PRE5050 Expert Machinery Tester among his working tools, due to its multifunctionality, its small size and the affordable price that it has. The following documents are included with the product. Quick user guide for the equipment in a laminated sheet. Vibration levels table to define alerts an alarms. Application for tracking vibration and temperature trends, with an automatic report of alert and alarm points, and graphs of radial and vibration, bearing status and temperature condition. Several articles related to the equipment functions.